What Went Wrong: The Rockies hit five home runs. The Angels hit one. How did the Rockies lose you ask? Well, all of the Rockies home runs were solo shots. Yes, exactly like the Sunday afternoon loss in Cincinnati. The Angels, on the other hand, hit 14 singles, stole four bases, had a number of productive outs, and just played beautiful baseball in general. They're the better baseball team, obviously, and it showed in every phrase of the game this afternoon. Turning Point: Mike Trout led off the game with a single. Torii Hunter followed with a single and both runners advanced 90 feet when Tyler Colvin missed the cutoff man. Albert Pujols hit a sacrifice fly to make it 1-0. Hunter then scored on a wild pitch to make it 2-0. That all happened within about 12 pitches. Well, what can you say? At least he pounded the strike zone? At least he kept them in the ballpark? I have no idea. It's his first big league start of the season. Maybe the second will go better. Maybe not. Come to think of it, I'm going with probably not since it looks like he'll be matched up against Justin Verlander in Detroit. 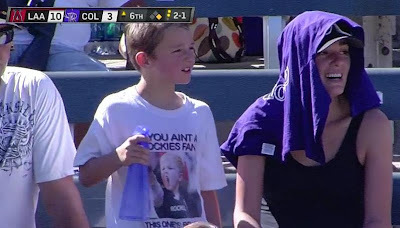 Highlight of the Afternoon: My favorite of the Rockies five home runs today of course belongs to Carlos Gonzalez. In you're wondering who hit the others, it was Marco Scutaro in the 1st, Chris Nelson in the 6th, and Tyler Colvin connected for a pair. 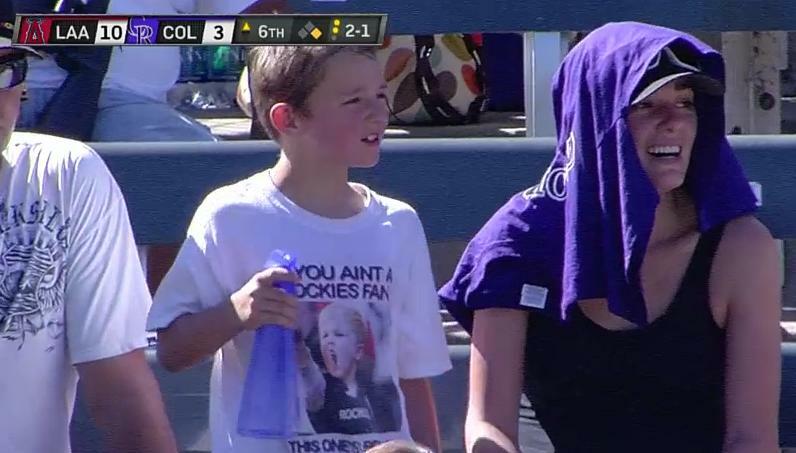 We raise them well in Rockies Nation. What's Next: Can the Angels leave now? Christian Friedrich (4-1, 4.50) vs Ervin Santana (2-7, 5.33)... 1:10 first pitch. Final Thoughts: And so ends the Esmil Rogers Era in Colorado (unless by some small miracle he clears waivers). He was the player designated for assignment to make room for Jeff Francis this afternoon. Esmil was an enigma over his 70 appearances (22 starts) spanning the past four seasons. Live arm, big potential, a guy you could conceivably pencil into your rotation or at the back end of your bullpen. Yet in 184.2 innings, he posted a paltry 6.77 ERA and he allowed nearly TWO baserunners per inning. I don't know what all the peripherals were but I imagine they looked pretty disgusting as well. I mean sure, he'd flash his potential for an inning here, dominate for three innings there. During those moments it was easy to understand why the Rockies were being patient with him. Then one bad thing would happen and the confidence and effectiveness would inexplicably disappear, often lingering into his next appearance or two. That's why Jim Tracy said today that it got to the point where he didn't know where to use him. Sure, on a good day Rogers would be fine in the eighth inning. On a bad day (and there were several) he could destroy the entire game for you regardless of the inning and situation. Feast or famine you might say. He just never got it all together or established consistency. I don't know why. Perhaps he just needs to hear a different voice when it comes to preparation. Maybe he needs new surroundings. It's hard to say, but it's really too bad it didn't work out in Denver. He seems like a really quality kid. A plus guy to have in the clubhouse in that he didn't cause drama or allow his on field struggles to get the best of him off the field. For those reasons I wish him success whenever he ends up.